Notes: The Ash Pug (Eupithecia innotata f. fraxinata, originally known by the binominal name Eupithecia fraxinata, but now believed to be a form of Eupithecia innotata) is widely distributed in woodland, hedgerows, parks and gardens throughout much of the British Isles. Previously considered as two separate species, Angle-barred Pug and Ash Pug are now normally regarded as different forms of the same species using different foodplants. 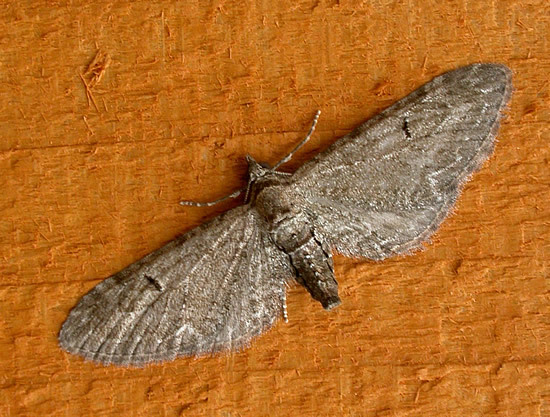 It is also possible that true E. innotata (Angle-barred Pug) does not occur in this country, and that they are all forms of Ash Pug. In Hampshire relatively rarely recorded, usually associated with Ash. Not recorded from the Isle of Wight to date. Wingspan 18-24 mm. The forewings are generally dark brown or grey with few distinguishing marks apart from a small white tornal spot which may not be present on the frequent melanic forms. Two broods are produced each year with the adults flying in May and June and again in August. Moths of the spring brood are usually darker in colour than the later specimens. Larva feeds mainly on Ash, over-wintering as a pupa. Larva of true E. innotata (Angle-barred Pug) would be expected to feed on Sea Buckthorn.